The federal government can easily afford a job guarantee program, becoming our employer of last resort. Involuntary unemployment is barbaric. In the wealthiest country in history, almost 30 million people wish they had full-time work. But, as always, there aren’t enough jobs. And because economic security requires decent work, it’s unsurprising that 50 million people are poverty-stricken and 16 million children are hungry. This is a disgrace and an economic error: the US government can easily afford a Job guarantee (JG) program, becoming our employer of last resort. A right to a job may sound outlandish, but it’s common sense. You need dollars to eat, and unless you steal the dollars, you generally have to earn them. If the government wants to protect property with cops, courts, and prisons, issue a single, common currency, and tax and fine us in it, it should at least guarantee we can work for our own dollars. Politicians ramble about equality of opportunity and the dignity of work, but to pull ourselves up by our bootstraps, we need boots. And lest our boots stomp each other’s necks in senseless competition for too few jobs, we need a job guarantee. A job guarantee isn’t that radical. Thomas Paine proposed one in 1791. In 1944, FDR included the right to a living wage job in his Second Bill of Rights and his Republican opponent promised state-ensured employment. The Universal Declaration of Human Rights enshrined the right to work and philosophers Rawls and Dewey advocated government provide enough work. LBJ deliberated a JG and Martin Luther King Jr., demanded one. In 1977, the Senate proposed legislation guaranteeing employment, allowing residents to sue the US government should it fail to provide it. The litigation provision was cut, but the final Humphrey-Hawkins Act authorizes Uncle Sam to “create a reservoir of public employment.” According to legal scholar Cass Sunstein, in 1990, an overwhelming 86 percent of respondents expressing an opinion wanted that reservoir. This January, the JG still polled high at 47 percent—even higher among people of color—despite its relative unfamiliarity. Would a job guarantee just create dismal make-work? No. Even ultraconservative idol Bill Buckley admitted there’s always something to be accomplished. New Deal employees built dams, bridges, roads and parks. Similar efforts have succeeded in Sweden and South Africa. Congressman Conyers has proposed creating enough public works for full employment, targeting decaying, unsustainable infrastructure. But JG employees needn’t construct trains or solar panels. Locally administered, non-capital-intensive programs have thrived in Argentina and India. Economist Pavlina Tcherneva has extensively researched Argentina’s decentralized strategy, which emphasized childcare, eldercare and community gardening, empowered women in particular and swiftly slashed extreme poverty by 25 percent. A bottom-up JG could bolster small businesses and nonprofits, and co-ops could apply for JG grants to pay wages. Neighborhoods wouldn’t have to bankroll Walmart or McDonald’s. It may sound expensive, but a JG would pay for itself. “Deficit owls” argue we can afford much more federal spending of this type. Remember, current anti-poverty programs like unemployment insurance pay people not to work, destroying human capital, sales, output, and the tax base. Estimated spending for a national infrastructure JG is $750 billion; bottom-up models, cheaper. JG outlays would replace or reduce the costs of much current anti-poverty spending (roughly $746 billion), with exponential benefits. The Treasury should finance a JG, but national, state or local agencies could administer it. As conservatives Kevin Hassett and Peter Ferrara have argued, Obama-style stimulus is sloppy. Unlike a JG, it doesn’t target households directly. Elegantly, JG spending is inherently constrained; a JG would implement a universal guaranteed wage—effectively the new minimum—and employees could join or leave in response to private sector booms and busts. Would jobs for all skyrocket wages and prices, spurring inflation? Such unfounded belief holds the jobless hostage to hysteria. The JG is an inflation stabilizer, easily compatible with additional precautions. Because non-JG employees could quit for a JG job, their bargaining power would increase. By the same token, businesses could hire JG-trained employees, so employers’ negotiating power would increase as well. Thus, wages wouldn’t spiral. Furthermore, guaranteed employment for low-income individuals would discipline the prices of goods and services they typically buy. Aside from the economic benefits, we deserve to participate in society as both producers and consumers. Participation is a premise for both collective enterprise and the self-determination Americans cherish. 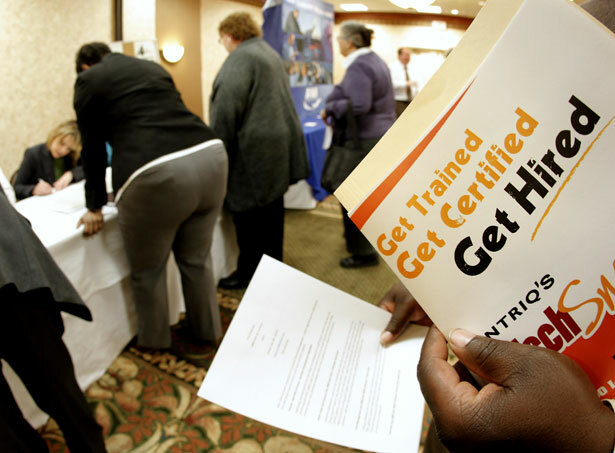 Even the best education and training programs cannot assure full employment. We need to change the economy, not people. On that note, a JG is key to the movement for further reforms. It’s a complementary framework for the living wage campaign. It offers strikers security. It relieves parasitic student debt. JG wages could even be deposited into postal banks. A JG would offer a hand-up from the isolation and stagnation often accompanying joblessness. As economists Sandy Darity and Darrick Hamilton argue, it would also combat racist hiring discrimination, anti-immigrant sentiment and crime. Some critics don’t want dignified living to depend on wages, preferring an income guarantee. I’m sympathetic, but people want checks and good jobs. Moreover, unemployment, like disenfranchisement, feeds the fat cats. Paying people to sit on the sidelines, without offering an option to participate, can finance apathy. To paraphrase MLK, call a JG what you want. I call it common sense. And I call it justice. Raúl CarrilloRaúl Carrillo is a student at Columbia Law and a graduate of Harvard College. He is a co-organizer for The Modern Money Network (MMN), an interdisciplinary educational initiative for understanding money, finance, law and the economy.